Today's painting is a quick floral study. I like doing these because they lend themselves beautifully to watercolor, the organic shapes provide a wonderful opportunity to practice brush work, incorporate hard and soft edges, and play with color. I hope you enjoy this video. It has been a terribly busy week, with not much time to paint or sketch let alone play with my new GoPro. Sad, really. Finally I was able to sneak in some painting time, capture it on GoPro and got to play with video editing. It is fun and learning to do some new things, which is always good. I hope that with time things will become streamlined and it will not take as much time and effort to create these videos. Here's today's painting and demo video. I used only three colors here - Aureolin, Cerulean chromium and Burnt sienna. I had a fun lunch break today, with a quick sketch, and a quick capture using a friend's GoPro. I quite like the little device. I am quite new to GoPro and video editing and sharing, and there is a lot to learn here. It is always fun to learn to do something new, isn't it? Enjoy this quick 10 min sketch from my lunch break. I happened upon this gorgeous photograph of sunlight streaming through autumn leaves and just had to paint it. Urban Sketchers is celebrating its 10 year anniversary this year, and are celebrating with year-long workshops all around the world. Click through this link to find who all are participating and where you signup for a workshop. As part of the 10x10 series, we are organizing a series of 10 workshops in the San Francisco Bay Area. You can find more details of the workshop here. We have a fantastic lineup of 10 instructors, teaching a variety of topics related to urban sketching. Whether you are a seasoned sketcher, or never sketched in your life before, there is something for everyone. Urban Sketchers is a movement the embraces spontaneity and immediacy, and your willingness to be part of your environment capturing it on paper is all that is required. The spots are filling up fast, so register soon. I am honored to be teaching alongside such wonderful artists, and my workshop specifically is about drawing fundamentals as they apply to urban sketching. My goal is to simply the concepts, and teach the principles that are most important to doing a quick capture of an urban scene and create a pleasing sketch. The idea is to arm everyone with the skill and the confidence to set out on their journey of urban sketching. Description: If you like to draw but are intimidated by being out and about with your sketchbook, this is the workshop for you. The goal is to get you comfortable sketching outdoors in a friendly group environment, and arm you with skills you can use to make drawings that you can be proud of. We’ll focus on using simple drawing tools that you can carry with you everywhere. You’ll learn drawing principles that will help you distill a complex scene into a simple, pleasing sketch that captures the immediacy and energy of the place. Handout with drawing principles covered in the workshop. I will have a good assortment of drawing materials (like paper, pens, colors etc.) with me for everyone to use. A sketchbook, size 5x8 or above, that can take watermedia. I use Stillman & Birn Epsilon. 2B/4B graphite pencils or mechanical pencil, eraser. A selection of waterproof pens of your choice. Travel watercolor kit, waterbrush or regular watercolor brush (in which case you will need to pack water supply). If you don’t have a travel kit, I recommend something simple like Winsor Newton Cotman Watercolor Sketchers Pocket Box. A portable stool (recommended but optional). Please email suhita@gmail.com for more information and registration. Last year was a very good year for me. It was the year when, for the first time, I started identifying as an artist. While I realize that the road is a long one, and it will probably be a really long time before I see results, for the first time I started thinking of things in the long term. I usually have goals at the beginning of each year for what I want to accomplish that year and where I want to be end of the year. For the first time in a long time I have no such goals. I am feeling pretty good about how things are going and if I keep working hard at it, I believe that sooner or later everything will come together. And to get the year started right, here are a couple of paintings I did today. Another another one in which I tried a couple of new colors - DS Bordeaux and DS Lunar black. With a lot of hope for all the good things yet to come, I wish you all a very happy new year! One of the themes for December challenge on arttutor.com is Fashion Statement. I chose a reference photo from pixabay.com and painted this. It is not great and I might not enter it into the contest after all but it was good for me to get back into painting people in watercolor. Last week has been very difficult, I still don't have the words to articulate all that I am feeling ... but after many days I was finally able to muster enough enthusiasm to go out and paint. It was a lovely day, and it did lift my spirit. I am continuing to do well with my "3 paintings a day" project. 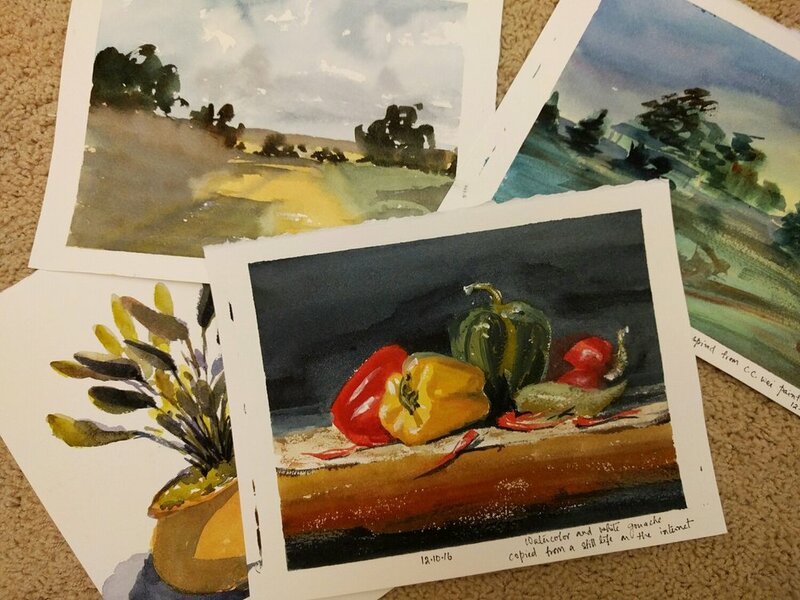 To be honest, it is not always full paintings per se, sometimes they are as simple as color studies and other times they are studies of paintings I admire. Even so, doing three pages of paintings a day is really helping me make progress and be consistent. For today's study I setup a little still life at home, and did a few paintings of the still life. It was a good night of painting. I really enjoyed this like colorful study. There is not a huge amount of value contrast in this painting, but I didn't mind that. The color hue contrast does the job well of separating the shapes and bringing focus. I wanted to do a more careful study of the teal tea pot next, so I setup a still life with just the teapot and I added the orange bud for some interest. Again, I wasn't able to achieve much value contrast, and I didn't wait for the wet areas to dry before going back in there ... but still I like the effects that achieved and how the whole composition looks. The next painting I did a bit of an experiment. I discovered Debora Stewart this morning via her Abstract Flowers in Pastel video in artistnetwork.tv. I liked how she played with acrylics and soft pastels to make beautiful abstract florals, and wanted to see how pastels worked with watercolor. This painting looks a little dead in the water, but still I am glad that I tried out this rather crazy experiment. Goodnight and see you next time. Meanwhile, happy painting!